Perfect Bronze, Head to Toe! Get an instant head to toe sun-kissed glow. 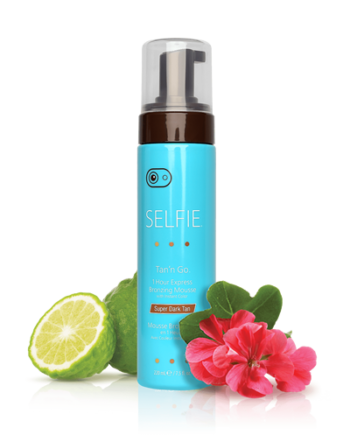 With Selfie® Instant face & Body Bronzer self-tanner you can give your body a sunless tan makeover in a matter of seconds. 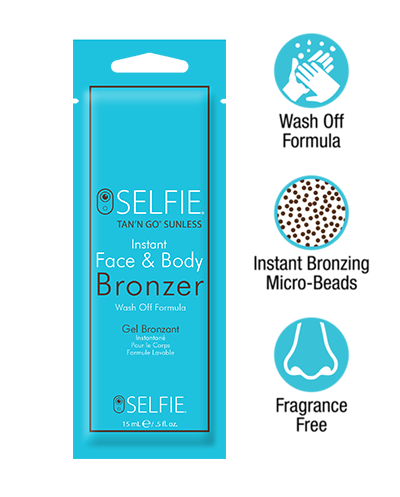 This lightweight formula is packed with bronzing beads that burst on contact with your skin, giving you a full body bronze that will last all day. 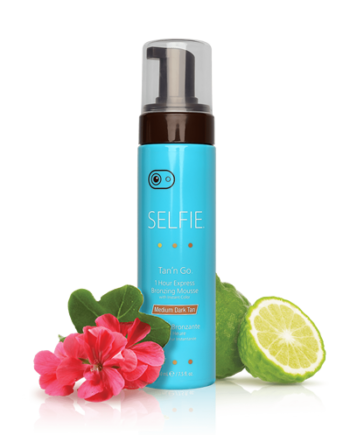 Selfie® Instant Face & Body Bronzer dries super-fast and is fragrance-free, so you don’t have to worry about that tell-and-tale self-tanner scent. With our Instant Face & Body Bronzer, you can see the depth of color immediately so you can control your tan level until you reach your desired tan level. 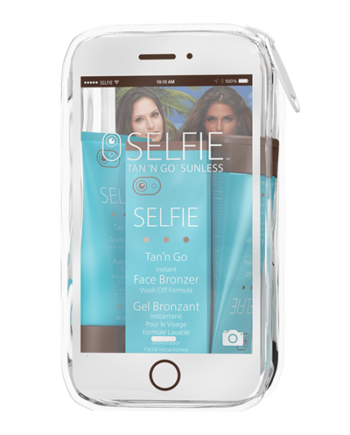 You can wash off your Selfie® tan whenever you want using a gentle soap and water. It works flawlessly for all skin types, it won’t stain your clothes, and it’s fragrance, paraben, and DHA free. 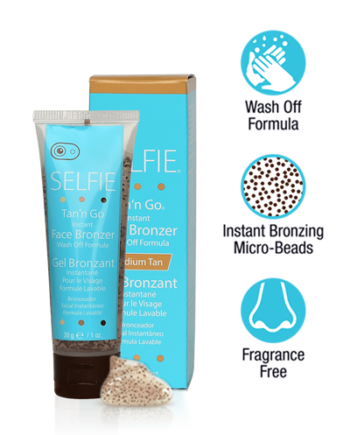 Before you start using the Selfie® Instant Body Bronzer self-tanner exfoliate your skin using an exfoliating mitt to buff off dead skin cells and guarantee a streak-free sunless tan that lasts forever. Squeeze a small amount onto the palm of your hands. Rubbing hands together to activate the bronzing beads. Use on clean, fresh skin. Gently, using circular, blending motions apply the Instant Body Bronzer over desired areas, working one area at a time, until fully absorbed. Wash hands immediately after application using a gentle soap and water. Allow skin to dry before direct contact with clothes. To remove your Instant Body Bronzer tan, wash with a gentle soap and water. 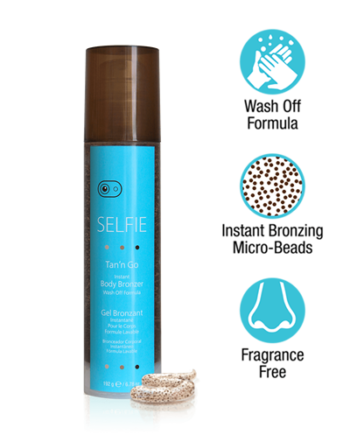 The Instant Body Bronzer formula can be used with your hands or with an applicator mitt. Both will provide a flawless, streak-free glowing bronze tan. Aqua, Propylene Glycol, Mannitol, Cellulose, CI 77492 (Iron Oxides), CI 77491 (Iron Oxides), Mica, CI 77499 (Iron Oxides), CI 77891 (Titanium Dioxide), Caprylic/Capric Triglyceride, Hydroxypropyl Methylcellulose, Diazolidinyl Urea, Iodopropynyl Butylcarbamate, Aminomethyl Propanol, Acrylates/C10-30 Alkyl Acrylate Crosspolymer, PEG-12 Dimethicone, Ethylhexyl Palmitate, Luffa Cylindrica Seed Oil.